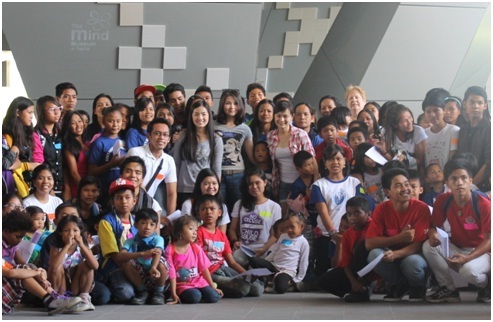 Last May 28, 2013, GMA artists - JoyceChing, Barbie Forteza and Krystal Reyes graced the event of Children’s Hour at the Mind Museum to spend time with 220children from various socially oriented organizations in Region 3. KAPUSO STARS as role model to children(Photo Shows): Kids from various organizations in Region 3 with (L-R center) Joyce Ching, Barbie Forteza and Krystal Reyes. “Basta isipin nyo lang na kaya nyo yan sa kahit anong pinagdadaanan nyo sa buhay” said Barbie Forteza while giving their words of encouragement. Despite of their busy schedules the teen Kapuso stars were still able to spend time with the kids and cheered them up. They are sharing their blessings by reaching out and being role models. Children’s Hour, through its program A+: Arts and Athletics, is providing creative and educational experiences for indigent children. Through these fun-filledactivities, public school education is complimented with exposure to arts, culture and athletics. This A+: Arts and Athletics activity is implemented in partnership with Bonifacio Foundation, Inc., and aims to give 2867 unprivileged Filipino children a day at The Mind Museum. The 3 teen artists will have their upcoming drama series, Anna Karennina which is set to premiere on June 3, 2013 in GMA Telebabad.